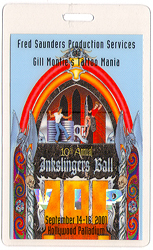 Description: 2001 10th Annual Inkslingers Ball laminate stagehand Pass. Official show laminate issued for the September 14-16, 2001 concert event. Description: 1988 All Areas Crew Laminate Pass. Item issued and owned by David "Cowboy" Conyers who was the sound engineer for the 1988 Tour. Description: 1990 - 91 All Areas Crew Laminate Pass. Item issued and owned by David "Cowboy" Conyers who was the sound engineer for the 1988 Tour.